First African American Senior Class President at Holloway Brown School (1975-1976). First African American President of the Student Government Council at Northwestern University Medical School (1979-1980). 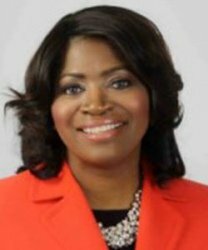 First African American female Senior Director at Kaiser Permanente, Ohio Region (1999 - 2001) and Vice president (2002 - 2013). .First African American Vice President at Health Spa (2013 - Present). First African American to be elected Chairman of the Board of Trustees, Saint Luke Foundation She will serve from 2016 - 2018.